Facebook is quite possibly readying the transition from a place for idle time to a place where real commerce transactions take place in the world's largest social network. Warner Brothers announced late tonight that the company is beginning testing of select movies for purchase or rental through the company's Facebook pages, payable with Facebook credits. The first movie title to be available? "The Dark Knight", available for rent for 30 Facebook Credits, or $3, to US customers. While the movie distribution business has gradually moved from warehouse retailers like Blockbuster and Hollywood Video to iTunes, Netflix and Amazon, Facebook hasn't yet been seen as a player. But with hundreds of millions of people using the site as a daily destination (often multiple times daily), it may make sense to put this content in front of the screen where people are spending significant time. Tonight's release says film viewers will have full control over the film for up to 48 hours after purchase, including the ability to watch the show in full screen, or to pause and resume the film upon login. 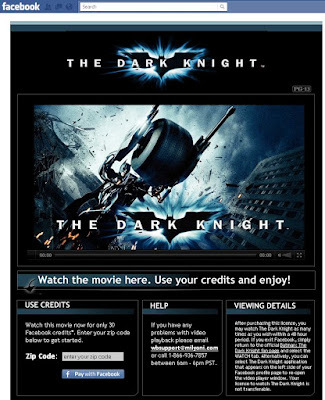 Of course, being on Facebook enables users to comment on the film and update their status, so expect a lot of "I'm Watching the Dark Knight!" to be in your feed stream coming up.